In the 50 years since Night of the Living Dead first introduced to the big screen the idea of mindlessly cannibalistic human revenants who spread themselves like a disease, the zombie movie has touched on just about every possible iteration of the basic scenario, in just about every possible setting, that one could reasonably imagine. As well as a great many iterations that aren't reasonable (I remain, these several years later, perplexed and upset that "Romeo and Juliet with zombies" was something that got made). Still and all, Cargo comes awfully close to hitting on one of the iterations that I think surely hasn't been done very often, and includes it in an overall narrative structure that hasn't been done very often either. That structure isn't the basic plot: this is Mad Max 2 with zombies. Very much so, in fact: it's not just about surviving the post-apocalyptic desert, with all the usual post-apocalyptic problems of resource scarcity and the breakdown of civilsed mores made even more difficult because of all the damned zombies everywhere. It's all of that, in actual Australia. That really does add a great deal to the film's appeal, but by itself, "Mad Max-style post-apocalypse + zombies" isn't very new; Resident Evil: Extinction is the most obvious forerunner in that sub-subgenre, and it's certainly not the only one. Where things get special is that directors Yolanda Ramke & Ben Howling, working from a script Ramke adapted from their 2013 short film, have married this setting to the much rarer "zombie film as a domestic drama" approach. This among the few zombie films I can name that is absolutely not in any way a horror film: rather, it is a story about a father's desperate attempt to care for his daughter, with a zombie apocalypse providing a colorful backdrop. Here's the situation: Andy (Martin Freeman) and Kay (Susie Porter) have been living very successfully on a houseboat for some long while, as a zombie plague ravages the countryside. It would seem, but it's never stated (things that seem to be but aren't stated is one of the great strengths of Cargo's opening act) that complacency is leading the two of them to get a bit sloppy: Andy notices a capsized yacht one day and gathers canned food from it, with Kay obviously doubting that it's possible to be entirely sure that it's safe. Her skepticism doesn't go very far, though: she heads to the same yacht, and is attacked by the zombie that Andy more or less accidentally managed to avoid before. That starts a 48-hour countdown before she loses her faculties and becomes just one more of the legions of the mindless undead. Andy initially refuses to believe that anything is wrong, insisting on leaving the safety of the boat to bring Kay to one of the remaining hospitals to be treated for her gushing leg wound. Soon enough, he's vividly proven wrong, and before he's able to kill the thing that used to be his wife, she bites him, starting his own 48-hour countdown. The wrinkle here is that Andy and Kay have a one-year-old daughter, Rosie. Knowing that he's beyond hope, Andy immediately pivots to a different form of survivalism: scouring the ruined earth for any uninfected person who'll be willing to take in his daughter, and isn't also a raving psychopath. And doing it all in less than two days, during which he grows weaker and weaker and more dangerous to his precious girl. As a microcosmic study of family relationships in times of unendurable stress, Cargo's a pretty nifty little psychological drama in genre film clothes (it's more than a little bit like this spring's A Quiet Place minus all of that film's most unbearable failures of logic). Ramke & Howling, making their first feature, have a gifted sense for keeping the scale tightly focused on just the characters who matter, while letting details from the fallen world around them bleed in through tiny details of design. To name just the first thing that pops into my head: the watches Andy and Kay both put on when their 48 hours start. You can sort of guess the first time we see one, and then it becomes obvious later as we see more, that these were some kind of government-issue emergency device, part and parcel of the "so you're about to become a zombie" first aid kit that we see over Kay's shoulder. That puts over a lot of the stock exposition of how badly the world has gotten without making a show of itself, or interrupting the character drama. Or take the little detail about the hospital: it's presented in the script entirely in terms of Andy's refusal to accept the fate that Kay has resigned herself to, but it also is our first indication that there's actually still a bit of an infrastructure left in place. It's stuff like that where Cargo shines: clean little storytelling beats that have a lot packed into them. It's also just a really smartly-shot film, by cinematographer Geoffrey Simpson, with compositions that allow the lonely Outback to present itself behind the characters, without necessarily flattening them. So far, so good, which means that Cargo is either a humane masterpiece of a zombie film, or has some pretty big missteps to counterbalance this. I am sorry to say it's the latter. First, and most pettily, it's horribly over-edited by Dany Cooper and Sean Lahiff: the film's overall strategy is to go slow and shuffling, all the better to contrast with Andy's increasing panic, but the cutting cares about neither of these things: it simply darts about with the mania of a much more action-packed film than this one. Second, something hugely important is missing from Freeman's performance. As a distressed husband, he's excellent, and as a man growing increasingly ravaged by a disease that represents an omnipresent ticking clock over his head, he's even better: the little fluctuations the way he holds his neck and his ability to look at or through different things as a way of distinguishing his shame and self-loathing from his unbidden thoughts of "hey, that raw meat looks good" are superb. 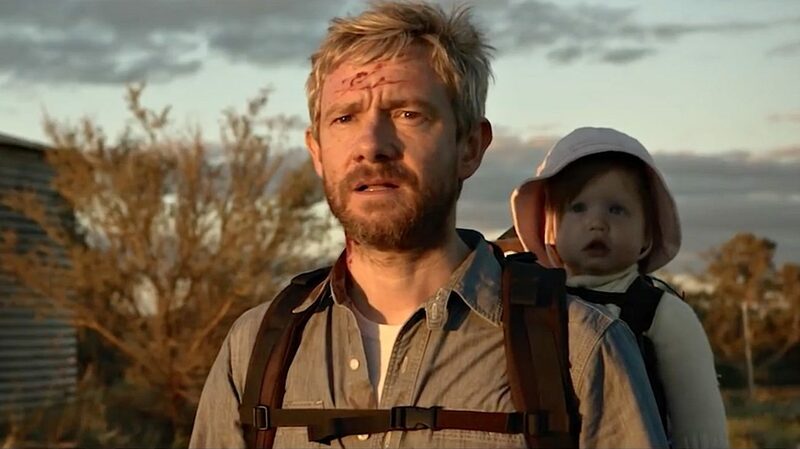 But Cargo isn't really about either of those things: it's about the lengths to which a dad will go to safeguard his daughter's life, and that's what Freeman lacks: any sense that he actually cares about Rosie as more than the one last obligation he has to take care of. It rips the very heart out of the film. This could have been a proper tearjerker hiding in a zombie film; instead, it's just kind of sad. Lastly, there's the film's other plot. Throughout, the film cuts back to a young Aborginal girl, Thoomi (Simone Landers), in a reverse of the A-plot, as she tries to cope with her zombified dad. Eventually, Thoomi and Andy cross paths, and form a sad, desperate little family unit. All of which is fine, even great. If Cargo has one honest-to-God original thought, it's that it keeps showing the evidence of a movie about how Australian Aboriginal people might deal with a zombie plague in a very different (and substantially more effective) manner than the whites. The big problem here is of focus: there's just enough of this material for it to become extremely obvious that it's not amounting to anything. Other than Thoomi, none of the Aboriginals end up having any personality to speak of (the one played by David Gulpilil sort of does, in that Gulpilil brings with him decades of accrued screen presence), and the tantalising details Thoomi offers to Andy of how her people are coping remain strictly decorative, an opportunity to add a sense of exotic mystery without actually building a plot out of it. With Thoomi providing such a comfortably unforced performance, it seems a damn pity that she's never more than an add-on to Andy's story, and it's even more galling that Cargo passes by such an obvious opportunity to make a genuinely fresh zombie movie, rather than just a gussied-up version of old ingredients. The mere fact that such an obviously bolder movie exists with so relatively few major tweaks to the Cargo we got (really, just bringing Thoomi and Andy together faster, and spend more time on her part of the backstory, rather than including it in brief snippets would do most of the work) does, I'll admit, make me a little less kindly disposed to the very solid Cargo-that-is than it altogether deserves.